Small interruption to note Stan Drake's "The Heart of Juliet Jones" is still available. That guy could draw! Carry on with cool thread. John, I paused before posting, long enough to acknowledge that it'd be embarrassing if it wasn't you who drew it. Although it turns out that it wasn't, I hope no offence was caused. The face is beautiful and I do see enough similarity to have convinced myself that it was done in your hand. I do hope that comes over as complementary. I'll now need to investigate the artist mentioned, who, till now has been off my radar. Having Stan Drake's work mistaken for mine is a GREAT compliment, Darren! About a quarter of the way down the page. I don't pay you enough for this, Darren! ---I don't pay you enough for this, Darren! Already paid in full sir! Thanks Darren! This is a great repository for the Wisdom of Byrne. Back when JB mentioned the "buzzards" I started taking Darren's hard work in gathering all the "pearls of wisdom" and started putting them into a document/PDF in case the thread was delet-i-fied. Well, the September "issue" is available and if anyone wants a copy, just send me an email and I'll send you the latest version* in PDF. * I am constanty fiddling with it. Latest version may vary. The second "issue" is filling up nicely, Darren! Keep 'em coming! Something, imo, JB knows about for sure! 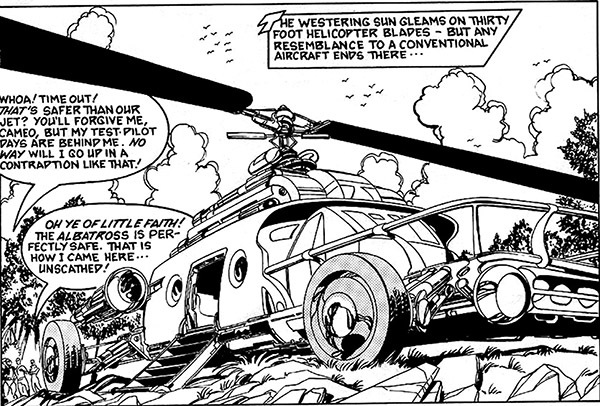 I've long admired how John handles wheeled vehicles, ever since I saw this image, in fact. [Edited to fix Link]---Thanks Eric. Darren, the cropping figures link is broken. Looks like you double pasted part of it.